The Treaty 7 flag has permanently joined four others outside of Calgary’s Historic City Hall, a recognition of traditional Indigenous land. 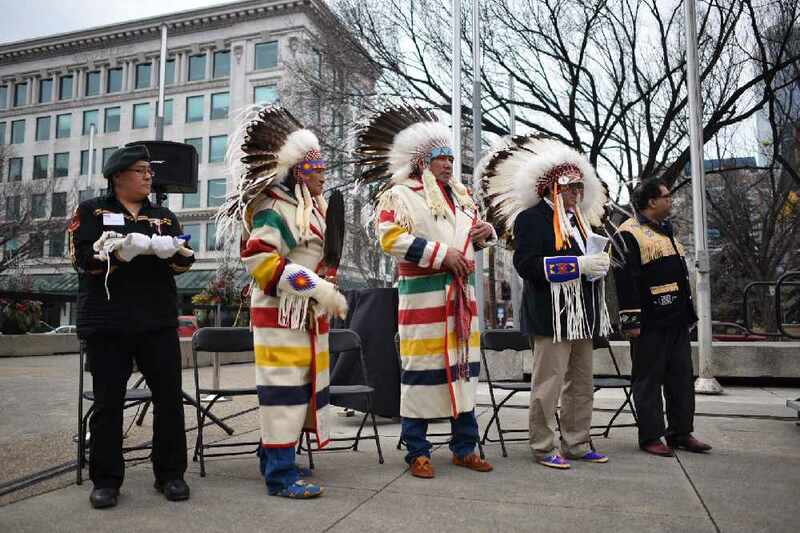 Kainai Nation Chief Roy Fox called the March 23 ceremony significant for a number of reasons. Calgary Mayor Naheed Nenshi said it was a small, but important gesture. “This is a gesture that says, ‘You belong here,’ to everyone,” he said. Fox had glowing words for Nenshi. “Our people have studied Mayor Nenshi and he is what we would call... ‘a real and honest person.’ We can’t say that about too many other people. So we just want to show our appreciation to the mayor in the work he has done in building bridges, not just between Calgarians in general but Calgarians and the Indigenous representatives in and around Calgary,” said Fox. The City of Calgary responded to the Truth and Reconciliation Commission’s Calls to Action through the adoption of the White Goose Flying report, by the Calgary Urban Aboriginal Affairs Committee in 2016. Twenty-five recommendations were provided through the report to help create a more equitable and inclusive society. One of those recommendations was flying the Treaty 7 flag along with flags of the city, province, country and the Union Jack at the municipal complex. “Flags signal political recognition, and Treaty 7 needs to be included in the same way as other levels of government,” said the White Goose Flying report. The new flag policy, which added the Treaty 7 flag, became effective in November 2016. The renaming of Langevin Bridge was also recommended in the White Goose Flying report. The bridge was named after Sir Hector-Louis Langevin, one of the Fathers of the Canadian Confederation and known for his part in assimilating Native students in the Indian residential school system. In January, city council voted to rename the bridge as Reconciliation Bridge. “It’s fair to say, and I don’t think any Canadian would disagree, that one of our greatest failures as a nation is the inability to include our Indigenous brothers and sisters in the prosperity and growth of us as a people,” said Nenshi. Nenshi and Fox agree that flying the Treaty 7 flag in Calgary does exactly that. The afternoon ceremony blessed the shared journey between Indigenous and non-Indigenous peoples with principles of mutual recognition and respect for shared history, and affirmation and renewal of the relationship between the city of Calgary and the Treaty 7 Nations.